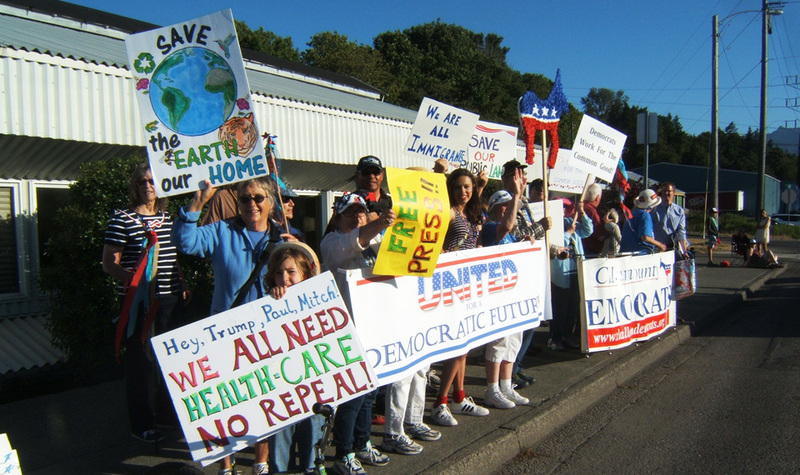 PORT ANGELES, Wash. – “Health care is a human right! Now’s the time to stand and fight!” That was the chant by Clallam County Democrats as they marched in the Fourth of July parades in both Forks, “Logging Capital of America” and a few hours later here in Port Angeles, county seat of this rural community on the North Olympic Peninsula. The reason is clear. Clallam County is a rural community and like rural America, is the hardest hit by the Republican drive to repeal Obamacare. Eric Lewis, CEO of the Olympic Medical Center, warned that about 22,308 residents of Clallam County are covered by Medicaid. At least 7,000 of them will lose their health care coverage immediately if the Republican cuts to Medicaid are approved. As a public hospital, OMC must continue to treat everyone regardless of ability to pay, he told a meeting of OMC Commissioners last month. OMC will lose $105 million over the next ten years, a disaster since OMC barely breaks even in its struggle to stay afloat financially. It is a disaster so stark that the Commisioners decided to write to Trump protesting the proposed Medicaid cut. The crisis seems not to move Senate Majority Leader Mitch McConnell who continues to orchestrate the drive to repeal Obamacare even as nine of his Republican colleagues in the Senate have announced they will vote “no” on the measure. Sen.Bernie Sanders of Vermont is traveling into rural areas to help organize fightback against repeal. He told a “Care Not Cuts” rally in Covington, Kentucky, July 7, that McConnell’s bill will terminate health coverage for 230,000 of McConnell’s constituents in Kentucky. Added Sanders, “We will not allow 22 million to be thrown off health insurance in order to give $500 billion in tax breaks to the top two percent” of wealthy tax evaders. They add, “This shocking trend is driven in part by increases in mortality rates for white working class Americans many of whom live in rural America.” These are regions Trump won and the Republicans continue to dominate even as uninsured people in these states fall ill and die from lack of health care coverage. As of Jan. 1, 2017 19 states have refused to expand Medicaid, they write. These are the so-called “Red” Republican states in the “deep” South and Republican controlled states in the middle of the country.